The building contractor Keir have provided Newsletter October 18 setting out the progress to date and the next steps. A crane is now on site with digging beginning in earnest. Work on the permanent site is progressing, with the digging work starting, to evacuate the foundations and underground car park for the supermarket. 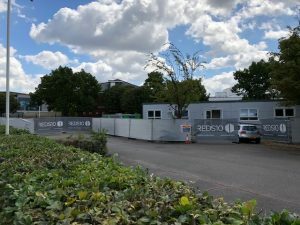 In preparation for the additional pupils starting in September, we are delighted to say that good progress is being made with the temporary building. Works for two additional classrooms are running ahead of schedule! We are now moving into the final stages of development, installing utilities and connection services, with work on the reception area and outdoor landscaping to conclude. We are aiming to have this extension operational by 24th August. As can be seen in the picture below, the progress so far is visible and moving faster than we had previously planned! Interserve were awarded the building contract on 19th July and began work on the 23rd. July 2018 – Click here for a pdf version. After a few weeks of not seemingly much happening, we can report that all party wall awards have now been completed in relation to the works and the adjacent buildings. Progressing these had delayed the developer on site, but they are now concluded and works to the boundary and planning in the works to start forming the building foundations can now commence. These agreements will no longer delay works on site and we are pleased to report that progress should soon be more visible. To be absolutely clear, the delay has had no impact on the design or funding for the project as these remain as per previous updates and information shared. 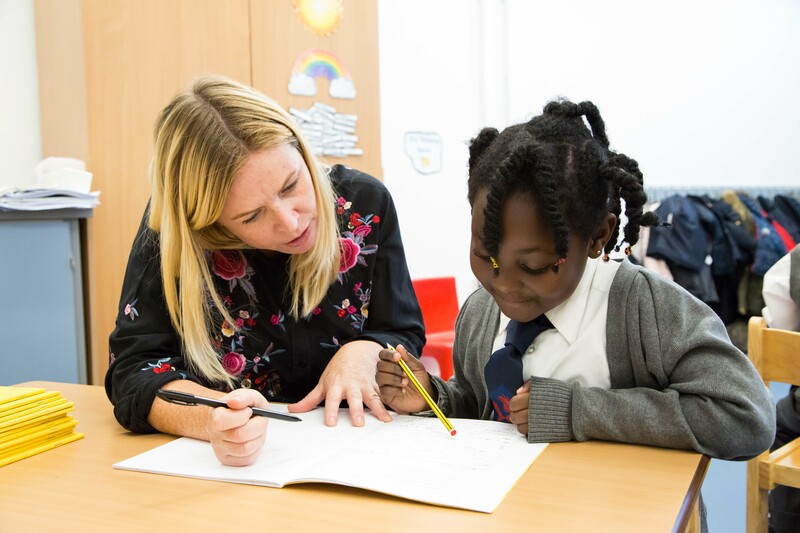 We are working with Lidl and their contractors to determine the programme to School occupation now, previously advised as October 2019; and will up-date on this further when agreed. All leases for the Summer 2018 extension are now in place and our contractors are appointed and on site. They have established their site compound and are currently awaiting ground test results to commence their foundation works ahead of the new cabins arriving. We are finalising the key milestones between now and handover, which is still scheduled for w/c 20th August and will also advise these for those interested in due course. ICT and FF&E are co-ordinating with this programme and the fit out of these will enable the School to prepare in the final weeks of August, ready for the start of the new 2018/19 academic year. March 2018 – Click here for a pdf version. The demolition phase at Ryde House is now nearing completion with construction due to start imminently. This is a promising start to the project and we remain optimistic that the programme will continue in this vein for a planned handover to the school in August 2019. Deer Park School was always planned as a two-form entry primary school. The school is currently single-form due to the space available at the temporary location. Our PAN (Published Admission Number) for September 2018 was 60 (as the school was due to have moved to the permanent site at that point) however, as we remain in temporary accommodation for a further year we have made the decision (and had approval from the Regional School’s Commissioner) to temporarily reduce our PAN to 30 for September 2018. The planning application for our expansion into Old Deer Park carpark has now been submitted. The black line on the diagram below shows the boundary to our existing buildings and site and the red line shows where our additional outdoor space and classrooms will be located. Once the application has been approved works will commence over the summer holidays. This expansion will give us much needed additional outdoor space; a classroom for our children moving in to Year 3 and a spare ’hall’ for indoor activities/assemblies/lunches etc. We are very grateful for the support extended to us from Richmond Council and the Education Funding Agency in securing this additional space. We will also be re-locating our main reception/administration area next to our pedestrian entrance so that is easily accessible for all our visitors and parents. Comments of support for the application are warmly invited from all our existing and prospective parents as well as other members of the community here. We are excited to see that demolition at Ryde House is well under way now. This is due to be completed by April 2018 and then building of the new school can commence! The Ryde House building is scheduled to start being demolished on 2 January 2018. All the planning conditions are with the Local Authority planning department and Lidl expect these to be signed off before this date. On 12 Dec, a local consultation was run by Lidl, informing local residents of the planned demolition where 30 of the attendees were comfortable with the plans. The demolition is expected to take 12 weeks, with the contractor expected to start building works on site from Monday 9 April. Keir are the appointed contractor for the build programme and the Trust and ESFA attended the kick-off meeting today, 13 December, where the plans were confirmed and outline timelines were agreed. Hoardings will go up before Christmas and we are preparing a huge Deer Park banner for the site! 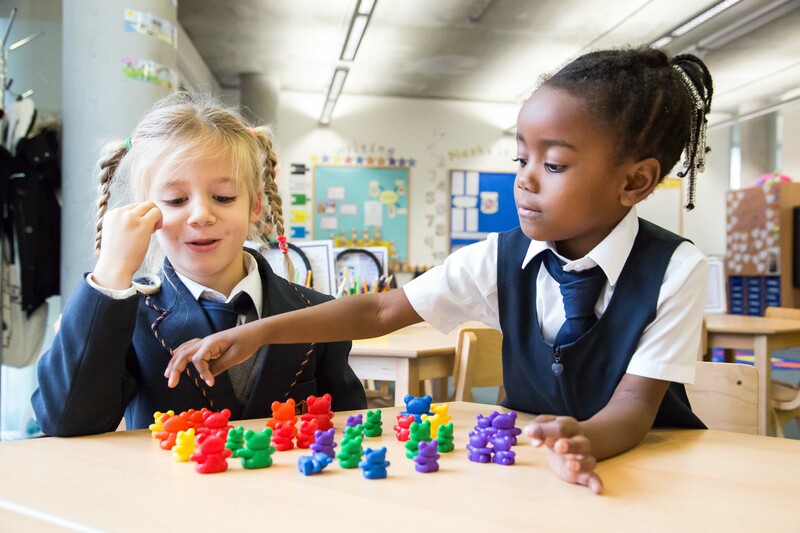 The programme is for a handover to the school at the end of August 2019 and while this remains possible, we are putting plans in place for there being inevitable minor delays that always occur to building programmes. The Trust met with the ESFA and Local Authority recently to continue the discussions for the expansion to the temporary facilities for September 2018. The ESFA has progressed the expansion into an area of the car park that is not utilised and we have outline plans for this expansion onto land mainly owned by the Local Authority. As previously mentioned, this will have two additional portacabins for September 2018. There are challenges in the area, mainly with increasing the number of toilets and the lack of play space. 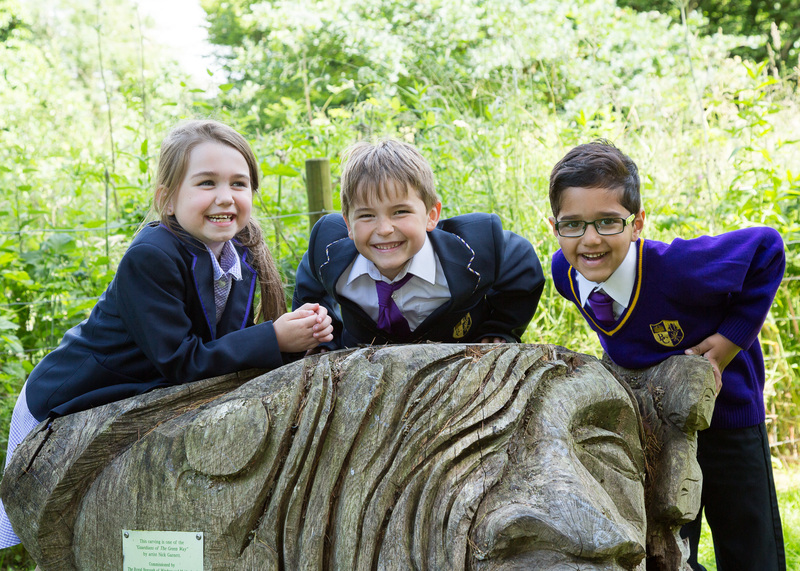 As you may be aware, our published admission number was to increase admissions in reception Sept 18 to 60 pupils. Having reviewed the temporary plans and the very tight handover for the new building, the Trust has decided that we will only take 30 children in September 2018. This will be from the admission point of Ryde House. The planned capacity number in 2018/19 would be 120 now, which is lower than the previously planned 150 and much lower than the potential of 210 that could be in temporary facilities for a short period of time in September 2019. This decision has not been taken lightly and was done so in consultation with the Local Authority and ESFA. We are continuing discussions about how more play space can be added to the plans and the Local Authority have been hugely supportive in considering potential options for this. We would also like to thank the RACC and ESFA for supporting the schools development and expansion. With the progress made over the past few weeks, we would like to invite parents to a meeting on 8 January 2018 at 3.30pm in school, to give more detail and the planned timeline for the new building. Happy Christmas and look forward to seeing you in 2018! 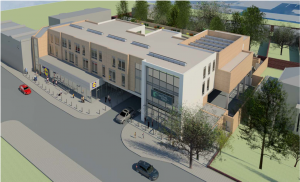 This bulletin aims to keep all interested parties of the latest updates that have been provided to us from Lidl regarding the new school site at Ryde House. The Trust, along with the ESFA have been in regular correspondence with Lidl over the summer holidays to get the latest information and we are pleased to be able to give you another update, with progress continuing behind the scenes. You will be aware that demolition at the site was planned for this July, however this has unfortunately fallen back due to the time it is taking for the planning conditions to be agreed. We are pleased to say that these have been agreed and we are waiting for the formal sign off from the local planning authority. All this needed to be agreed and in place before demolition can start and it has been a complicated process. Lidl are now in a position to move ahead swiftly with the next stages of conditions. Progress is being made and Lidl have been very helpful in keeping us updated on the progress of their negotiations and we expect these will be approved shortly. We can then start to see the building works begin! Lastly, we are very pleased that the work at our temporary site has been completed over the summer holidays, ready in time for the new school year. The old dance studio has been transformed into a fabulous classroom for year 2 and also provides a new space for mealtimes. This has freed up room in the original portakabin for our growing school. In the meantime, watch this virtual reality video to see what the school site will look like.